Do you ever have one of those days? The kind of day where you don't feel like cooking (gasp) or just don't have the time for making anything. What's the best cure for this kind of day? I say CROCK POT! This is not the healthiest of meals, but it is mighty tasty....plus it uses one of my favorite "convenience" foods- frozen bean & cheese burritos. BurrEnchiladas by girlichef yield: 5-6 svgs. Spray your crock pot with pan spray. Line up your frozen burritos along the bottom, however many will fit. 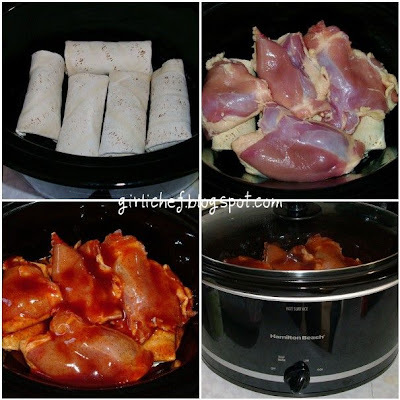 Lay chicken thighs over the burritos. 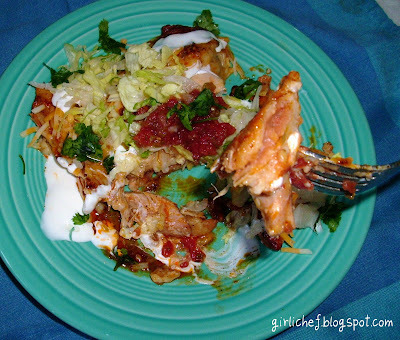 Cover with enchilada sauce. Put on the lid. Cook on low for about 6-8 hours. 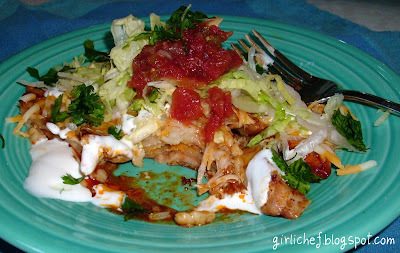 These turn out sort of like a cross between a burrito and an enchilada (hence the name)! Scoop "one" onto a plate; this usually consists of one thigh and one burrito. Remove the bone (it just slips out). Tear the chicken into shreds a bit with your fork. Sprinkle with cheese. Add your favorite toppers...sour cream, cilantro, salsa, lettuce, etc. This is easy and really, actually very good. Of course you can substitute a different kind of burrito or meat and get a whole new meal....without spending too much time in the kitchen...you know, busy and/or lazy day fare. How the heck did you come up with this? This is unbelievable!! There are days where either I don't have time or are being lazy. I love this!! Dar, this is a great idea and a wonderful way to beat the coming heat. You are a clever gal. OMGosh you could open a whole new chain based on that right there! Clever you are girli! 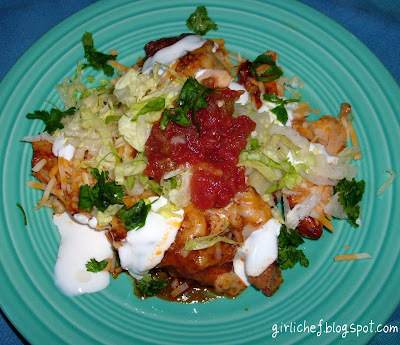 I miss the fried burritos of our youth at Jack-in-the crack and the hot sauce that came with it...my first job at fourteen working there :) I ate them every single day, and no wonder my son is a Tex-Mex freak stepper! I think BurrEnchiladas might be in my future! 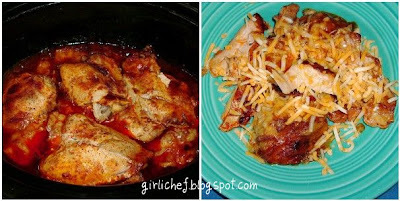 A winning recipe on every level- fast, easy, interesting delicious, CROCK POT! I'll try this one this week. What a cool idea! I have never thought of doing this. I am going to have to give it a shot. The end result looks delicious! It all works for me! YUMMERS. How in the world did you come up with putting chicken on top of burritos? You are SO clever. It looks delicious!! Sound excellent! I have to get myself a crock pot! Bean and cheese burrito brings back many memories. I do have a crock pot that feels lonely at the moment. I think it's time I dust him off and give him a job to do. =) Helloooooo...BurrEnchiladas!!! I'm all about convenience and good crock pot recipes for those days we are on the run - this will have to go into rotation, thank you! This is your idea of 'not feeling like cooking'? When I feel that way, Mr. Noodle is lucky to get a bowl of cereal. This is awesome - the fact that the burritos are pre-frozen is completely negligible. It looks like home-cooked to me! That looks fabulous. And 20-year old college kids will eat it.Love the ease - very good when I go into tech week at the theatre and come home and mainly sigh and not cook. You just kicked up easy cooking to a higher level. your mexican food sounds amazing!!!! i always like it! mmmm. Oh my does that dish look fabulous! I love all those flavors together and it just looks plain...I want to jump right into it. Sadly, we have no frozen burritos and me gots no crockpot. Hmmm, I must do something about this situation. But, yes, I have been wondering what to make for dinner tonight and this could give me some ideas. Thanks! That is a great quick meal! I have been saying for a year that I want to start using my crock pot again - thanks for reminding me...again! Oooh, this looks so yummy and cozy and comforting! I love the crock-pot - best invention ever - and I'm always excited to hear about new crock-pot recipes! That is one great plate of convenient, comforting deliciousness right there. BurrEnchiladas. Hehe. Nice. I never would have thought of doing that, but it sounds great! I'll have to give it a try. Heather- This is a fantastic idea. Absolutely perfect! I am still working on your instructions for the collages.. thank you. I will let you know how I make out! Oooooooh, this looks sooooooo good! I love that it's done in the crock pot, too. I love my crock pot! Okay...between your food, Girl E Chef's food, Coleen's food and my own catering I'm gaining weight!! somehow i always get attracted to colors and that plate is going so well with the food....blue, green, red...gorgeous! Wow! You really know how to make something look soooo good!